I choose you. I choose love.And the world says, "aww..."3.5 stars. I think my weeks-long book slump finally ended when I decided to go back and finish the second half of this. It's really too bad that I seem to have a roadblock every single time I try out a new Historical Romance author. No other genre works me over in such a way, to where I'm stuck in an exact idea of what I want to be reading (a.k.a. Kleypas type of wit), and if my ideals are not met right away, I tend to balk and kick my feet until someone slaps me on the back of the head and tells me to snap out of it.Thankfully, I snapped out of it. 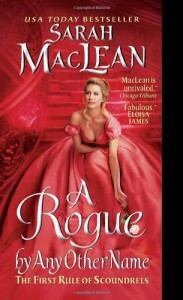 After knocking back a couple of PNR's, I finally put my big girl pants on and buckled down to read A Rogue by Any Other Name. I'm so happy that I continued on! Once I got used to the author's style of writing, I was able to sink into the story. Even though wit was not very prominent in the execution, MacLean still delivered with a not-too-formal flow, which made my read even more palatable the further I progressed. This really was an 'aww' type of tale. There's something about childhood friends-turned enemies-turned lovers which appeals to me. Chemistry is not easily developed in many stories, but I fell in love with this couple who conversed over the years of separation through letters. And one day, those letters stopped. A revenge plan set in motion started a path of ruin in what could have been a long and lovely friendship.If there was one thing of which she was certain, it was that Bourne would never allow her to be hurt.Unless, of course, he was doing the hurting.But oh yes...the best passion can come from immense conflict. "I'm going to make love to you on this fur. You're going to feel it against every inch of you, and the pleasure I give you will be more than you've ever imagined. "I'm sure that PETA will not approve of the above statement. Ah well.Speaking of PETA, this phrase made me think of the phrase 'tastes like chicken. 'She tasted like innocence.So of course, I can't just keep in the sweet romance frame of mind...oh no...my mind immediately goes to an image best used for a horror book.Image hidden inside, click only if you dare!But anyway...my mind goes to strange places. You all know that about me by now.I ended up enjoying this for what it was - a lovely little historical romance. I'll be checking out book 2 in the near future.